People is a simple contact database using the attributes of Haiku's filesystem to store addresses and other contact information. 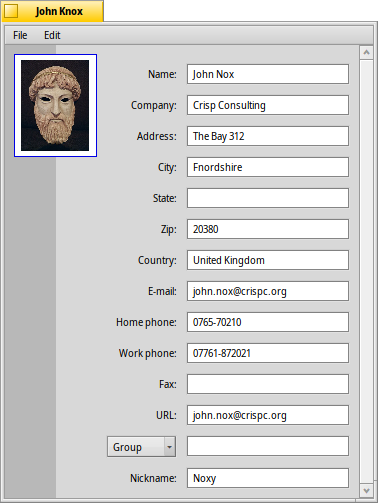 Every contact is saved as one Person file with its data in separate attributes. All are indexed and therefore searchable with a query. The Group attribute at the bottom allows assigning a person to one or more groups. Useful for "mass mailing" a number of people who, for example, work on a specific project. The pop-up menu offers all currently existing groups. If a person belongs to more than one group, the group names are delimited with a ",". These Person files are usually all saved in /boot/home/people/. To get a list of all your contacts, just open your people folder and display all attributes of interest. If you choose to organize your Person files in different folders, just use a query to display them all in one window. You can treat these files like any other: You can sort according to attributes (even a second sorting order by holding SHIFT while clicking) and of course delete, duplicate or rename Person files. Even the contact information can be edited directly: Clicking on an attribute (or ALT E) to edit works just like renaming a file. Once you're in edit mode, TAB and SHIFT TAB will jump from column to column.